This is a remarkable FRA 1472 Day restoration in that it has been basically a "do it yourself" effort. The owner has done most of the work himself on both the boiler and running gear repairs. He has hired expert help only when the scope of the work was beyond his experience or required engineering expertise. The boiler repairs were completed a couple of years ago and it is ready for FRA certification. The repairs to the running gear, including new brasses in the driving boxes and a new axle on the number 3 drivers are now complete. With the boiler back on the frame, there is still much work to be done, but reassembly can finally proceed! OK, I'll bite -- where is it? Congratulations to Skip..... I have been dropping in about every three years since the TRAIN Convention at IRM in 19?? #2 was running then, Skip gave me a cab-ride. That is very impressive, to not only own the locomotive, but to have the knowledge to do most of the work himself. He should be commended. It's a neat looking locomotive. Here's the link to the Mid-Continent Roster page. The No. 2 went out of service at the end of the 2000 season with a persistently leaky door sheet. Inspection showed that there were several areas of the boiler that needed work. Then the new FRA Part 230 regulations came in and changed the playing field. No longer was it possible to simply "patch 'er up and send 'er out". So, 13 years later the locomotive, now 101 years old, is nearly ready to start a whole new life. To call Skip tenacious is almost an understatement. He was the only one at Mid Continent that grasped the new FRA rules at the time back in the early 2000 era and made a number of good choices. He was smart enough to know he didn't know all he needed and sought out one of the most successful boilermakers to address what to do and how to do it. He did a lot of work himself but at the direction of a professional. He had very little rework so far in his journey to this point. A number of changes of plans yes, but he wasted very little money on mistakes. It is the rework that eats you alive, you pay twice, sometimes twice and a half for what could of cost you once. Doing your home work pays off, not doing your home work gets very expensive. It's a long road by yourself. He has had a lot of help over the years for sure, but it was him calling the shots and him paying the bills. Add one heart attack, with quad bypass, intestinal cancer, a few deaths in the family and a serious car accident in the middle of all the restoration work. Another thing most of the work on his locomotive was done outside, no pit, no roof. In the mean time he also works in the restoration shop and has been a ramrod on a few roof jobs on coaches. Last month almost single handedly repaired the truck on our Soo Diner car #2017, assembled the rear truck for the Montreal tender which is now under the frame. Rebuilt one of the trucks on the Copper Range #25. He may be a dirt floor mechanic, but he gets more done in one day by accident than most of us do intentionally in a week. That is a quote by former CMO JE, have known Skip for 45 years or more and he knows how to make things happen. Sometimes that bothers people though? Again Congrats Skip on the progress so far. Regards, John. Went through today, jacketing is on, piping, handrails, and accessories are on, progress seems very rapid at this point. Glad you were able to stop by Mid-Continent! The locomotive you saw is the Lake Superior & Ishpeming No. 22, one of six LS&I consolidations in preservation. It is in the very last stages of a complete cosmetic restoration. There is more cab plumbing to reinstall and some more painting and final lettering left for next spring. This non-FRA compliant restoration will make the locomotive appear to simply need water, coal and a fire. The Saginaw Timber No. 2 is inside the engine house. The owner is in the process of bolting the smoke box to the cylinder saddle. After final alignment of the boiler on the frame the smoke box will be riveted to the boiler. We hope to get that done yet this year before it gets too cold. At the risk of thread-drift, wasn't the restoration of LS&I 22 considered to be operational at one point? What changed? Was told that she got new flues and some boiler work done about or just in front of the time the FRA rules changed. The owners literally got caught in the middle. The locomotive was probably pretty close to running in the late 1990's when that work was completed, by the then ruling state of WI regulations. Of course after the rule changes the tubes would of come back out and a complete form 4 would of been necessary. There would be a lot of work to be done to make her FRA compliant by todays FRA standards. The owners lost enough on the project and decided to stop further work in regards to operating it. They decided on a very good cosmetic restoration instead. As stated the locomotive is not owned by M-C. While not considered by many to be a heavy locomotive it would of been quite heavy to run at MC on the light rail and tight curves on any more than occasional trips. I believe this to be the jist of the story. The part of it being too heavy for MC rails is my opinion. Is there any photos online of either restoration effort? Take a look at the Engine House Blog on the Mid-Continent website. You will need to look at each of the threads labeled Saginaw or Polson. And the photos go back a ways, so you will need to look at pages 2 and 3 as well. Most of the documentation has been published in the Mid-Continent Gazette, the quarterly members' magazine. Back issues are available through the museum office. Here is a picture of Lake Superior & Ishpeming 22 I took in November of 2012. 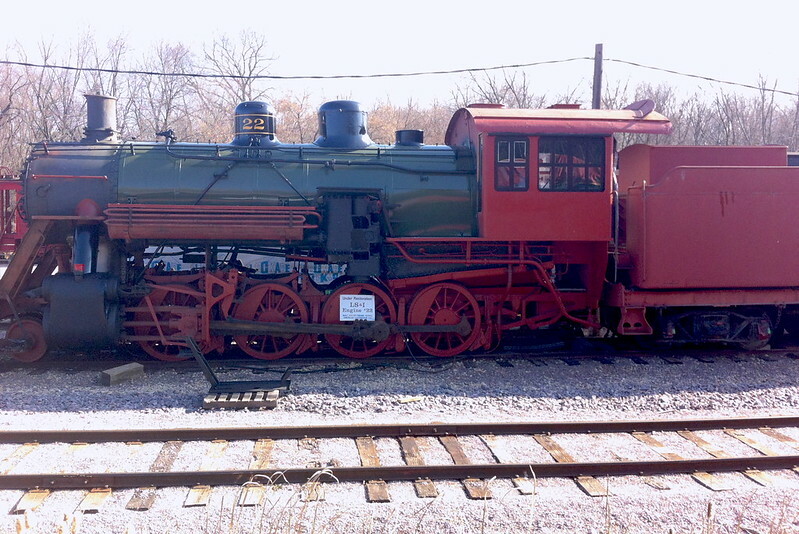 This locomotive is privately owned.